1964 Japan 1000 Yen Silver Tokyo Olympics Coin,Uncirculated,price is per 1 coin. Monetary Denomination: 1,000 Yen. Professionally Graded and Authenticated by NGC. Fineness (% purity): Silver 925 / Copper 75. Coin and holder Inspected by Coinsupermarket. WE SERVE & WORK FOR YOU! What we do to correct the mistake is what makes us stand out from others. Each of the 12 coins is in brilliant uncirculated condition and enclosed in a protective sleeve. 1964 Tokyo Japan 1000 Yen. All rates listed above are estimates and are subject to change. CONDITION: Uncirculated ( ~63 ). without Signature Required and. OUR LOTS ARE CULL FREE AND MAKE GREAT GIFTS AND CAN BE USED FOR EDUCATIONAL PURPOSES SUCH AT TEACHING HISTORY OR GEOGRAPHY. This is a 50 Yen nickel coin minted in Japan in 1964 (Showa Year 39). The coin is in an excellent condition as shown. Certified by NGC to MS 66. 1964 Japan 100 YEN Uncirculated Japanese Tokyo Summer Olympic Games Silver Coins. Shipped with USPS First Class Package. What you see is exactly what you will receive so please look carefully before purchasing. If you have any other questions please feel free to ask. Thank you All Coins are in excellent UNC, BU Shape! 1964 1000 Yen Japan "Tokyo Olympics" - Crown Size Silver Coin. I ship via USPS first class package. I combine shipping. Bright Uncirculated. I don't see any hairlines or evidence of cleaning. The coins you see are the ones you will receive. Here is a 1964 Japan Olympics 1000 Yen which has been graded MS66 by NGC. The coin has a beautiful design featuring Mt. Fuji and cherry blossoms. Although a relatively common coin, they are seldom found like the example here with attractive toning on both sides. 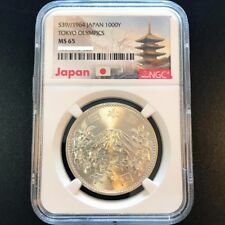 This silver 1000 yen from Japan was minted in Year 39 (1964) has been graded and certified MS66 by NGC. The obverse is adorned by Mt. Fuji while the reverse displays the Olympic Circles and denomination flanked by cherry blossoms. Buy it now or you will miss out on a nice opportunity. When I do, I’ll try to correct it. Raw ungraded coin. Coin is being sold part of an estate sale. Coin belonged to our Uncle. He bought his coins through coin catalogs like Littleton and Lauren Benson,INC.& H.E. Harris Boston Mass and the US Mint.The writing on the cardboard sleeves belonged to our Uncle the grade on there is how he bought them advertised from the coin catalogs where he bought them. Mount Fuji, located on Honshū, is the highest mountain in Japan at 3,776.24 m (12,389 ft), 2nd-highest peak of an island (volcanic) in Asia, and 7th-highest peak of an island in the world. It is a dormant stratovolcano that last erupted in 1707-1708. We photographed these beautiful coins against two backgrounds and under varying lighting conditions to show you how attractive they really are and to assist you with your evaluation. Lincoln Gold and Coin. 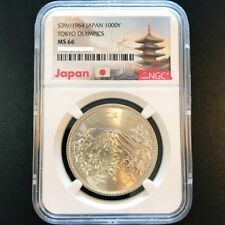 1964 JAPAN SILVER 1000 YEN TOKYO OLYMPICS MS 64 VERY NICE LOOKING COIN. Coin pictured is the one you will receive. Mary C., Numismatic Scholar. We accept all major credit cards issued by a U.S. bank or lendor. is proud to present. We reserve the right to cancel orders or refuse service at our sole discretion. Lot of ten 100 yen coins from Japan dated (1964), Y-79. What you see is exactly what you will receive so please look carefully before purchasing. If you have any other questions please feel free to ask. Thank you. Don't settle for less than a fantastic looking coin! The coins pictured are photos of the one's you will receive! Beautiful Silver. 925. The photographs of the coins you are viewing are the actual coins you will receive. Rare Coins, Currency & Bullion. 7.2 grams of 18k yellow gold. Sterling Silver Flatware. Sterling Silver Holloware etc. We are easy to work with and friendly. We look forward to seeing you! The coin in the photos is the one you will receive. SPECIFICATIONS FOR 1964 10 YEN COIN We are collectors, not professional coin graders. The pictured coin is the exact one that you will receive. HIGHLY PROFESSIONAL! SUPER FAST. Well, Would Buy From Again!". Silver crown, with Mount Fuji on the obverse. TOKYO OLYMPICS XVII. ♠ 1964 JAPAN. OFFICIAL GOLD SILVER BRONZE. Japan 1967 (Showa 42) 100 Yen First Year of CuNi Coins Light Broadstrike ↑Grade! 5 out of 5 stars - Japan. Silver 100 Yen, 1964, 1964 Olympic Games. Showa year 39. 7 product ratings7 product ratings - Japan. Silver 100 Yen, 1964, 1964 Olympic Games. Showa year 39. These are OUR photo identifiers ONLY. Feel free to call for help.